PHILADELPHIA, PA – The Wharton Social Impact Initiative announced this week that Revolution Credit, a company sourced by the Wharton Social Venture Fellows, has been listed on the global crowdfunding platform OurCrowd. 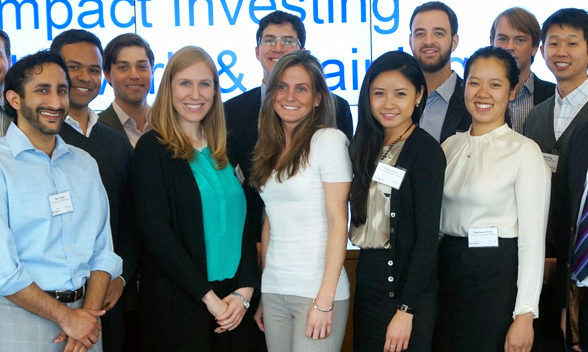 The Wharton Social Venture Fellows (WSVF), the premier student organization for impact investing at the Wharton School of the University of Pennsylvania, sources and conducts diligence on early and expansion-stage companies with venture-grade growth potential as well as intentional and measurable social impact. This spring, WSVF selected Revolution Credit from over 250 companies in six social impact market segments for its combination of potential social and financial value. Revolution Credit is an advanced engagement platform and database of unique consumer behavioral data designed to transform the credit decision-making process for both lenders and consumers. Revolution Credit provides consumers with a platform to show creditors that their credit score does not capture the full picture of credit-trustworthiness. In turn, consumers also get access to more products, approvals, and quality terms that otherwise are denied. Revolution Credit now aims to raise $500,000 on OurCrowd’s global crowdfunding platform. OurCrowd is an equity-based crowdfunding platform through which accredited and approved investors can provide venture capital funding for venture capital start-ups, with individual investments starting as low as $10,000. OurCrowd is sponsoring the investment round in collaboration with Locust Walk Impact Partners. Accredited investors will have the opportunity to invest in Revolution Credit on the OurCrowd platform and to participate in a closed deal launch webinar to learn about deal terms from the CEO himself. Housed in the Wharton Social Impact Initiative, the award-winning WSVF (formerly known as the Wharton Social Venture Fund) has focused on companies in education, energy, health and wellness, food and nutrition, environmental sustainability, and financial inclusion. Through WSVF, students simulate the investment process from start to finish and ultimately pitch the companies they have researched to an independent investment committee of Wharton alumni and other leading venture capital professionals. WSVF has won the MBA Impact Investment Network and Training Program (MIINT) Competition two of the last three years, and is one of the most sought-after student groups at Wharton. The Wharton School of the University of Pennsylvania does not provide any endorsement, either implied or explicit, in companies that participate with WSVF, Locust Walk Impact Partners, or OurCrowd. Neither the University of Pennsylvania, the Wharton School, nor student members of the WSVF are investors in participating companies. Companies run by current students of the University of Pennsylvania are not eligible for review by WSVF. The Wharton Social Impact Initiative leverages Wharton’s strengths to develop and promote business strategies for a better world. WSII uses core business competencies to spur strategic and systems-level positive social impact in Philadelphia and around the world. Through research, consulting, hands-on training, and outreach, WSII is advancing the science and practice of business social impact and developing business leaders who are equipped to lead in an increasingly interconnected and complex world. Established in 2010, the initiative’s cross-cutting work includes a multifaceted impact investing program, designed to launch student careers, conduct leading research, and educate the broader community on this powerful sector. For more information, visit socialimpact.wharton.upenn.edu. WSII also houses the Wharton Social Venture Fellows (WSVF), a student-led organization that sources and conducts diligence on early and expansion-stage companies with venture-grade growth potential and intentional, measurable social impact. The WSVF looks to identify and promote early stage companies that create positive social or environmental impact, and to prepare students to become leaders in the impact investment community, where sound investment principles are applied to complex social and environmental problems.